Lethal Injection offers a compelling view of vaccination and asks some important questions while revealing a few truths. Vaccination has been used as way to sterilize populations via slight of the hidden hand. Look forward to learning what the word vaccination really means, and the true purpose of the vaccination. Transportation – Take medicine to the problem. Destroy – Destroy pathogens, and viruses. Vaccination does NOT mean in any way that the patient develops a cure, healing, or immunity to, or from, any disease or virus. The only stated medical goal of a vaccination is to create antibodies. The precedent was set that a vaccine, isn’t a vaccine unless it negatively affects fertility. The definition and concept of a vaccine is based on sterilization. Vaccine induced sterility can be reversed. The government defines man as an animal when discussing pest control. The government doesn’t consider man a person. Man has been declared to be a pest. According to US CODE, man is the equivalent of a virus, as far as pest, or animals are concerned. Lonidamine is a cancer drug which causes kidney damage and male sterility. Only a small dose of Adjudin is needed to sterilize humans. The Novartis Influenza Virus Vaccine, or the H1N1 flu vaccine, has not been tested to see if it affects sterility, or to see if it is carcinogenic. Carcinogenic means it causes cancer. Adjuvants stimulate the immune system. Adjuvants can be germs. Squaline, believed to be the cause of Gulf War Syndrome, are commonly used adjuvants. The Vaccine Adverse Events Reporting System (VAERS) indicated a 2,500% increase in reports of still births and spontaneous abortions in the 2009/10 flu season, from the season before. Due to the Seasonal Flu Shot Which is now mixed with H1N1. They give pregnant women mercury filled vaccinations. The seasonal vaccine now has H1N1 in it so you won’t have to get two shots. The virus of 1918 (the 1918 flu) was re-sequenced after decades of work, it has a propensity to kill younger people, 18-40 years of age. The doctor who recreated the deadly virus said it could be used for planetary planning in the future. The single best thing that can cure you of the flu is good nursing care. Chicken soup beats doctors and medicine. That’s how they beat the flu in 1918. The United States military wanted it weaponized. There was a book written in 1920 titled The Horrors of Vaccination. The book was written to stop the mandatory vaccination of U.S. Military Troops. John D Rockefeller founded the American Cancer Society, afterwards cancer rates skyrocketed. John D Rockefeller’s scientists had already made the live virus-cancer connection long before he founded the American Cancer Society. Cancer didn’t come along until after vaccinations. In fact, one doctor at the turn of the 20th century (Dr. W.B. Clark in 1909 to the New York Press) states they had never seen cancer in an unvaccinated patient, but that all patients who have been vaccinated for cowpox had cancer in them. The Swine Flu vaccine had cancer packaged with it as a bonus, its good for the pharmaceutical business. Lung Specialist Wolfgang Woodarg told the E.U. General Assembly about the link between cancer and the Swine Flu vaccine. He explained that the worldwide swine flu pandemic was hype bought, and paid for, by the pharmaceutical industry. The polio virus was never stamped out, its form was merely changed with the use of vaccines on the general public. Thousands of military veterans die(d) from vaccines with squalene adjuvants which cause Gulf War Syndrome. We don’t hear about it from the media. Squalene is a chemical found in the brain and nervous system. When used as an adjuvant, the body goes into self destruct mode (in a way) by attacking its own nervous system (the only place in the body where this chemical occurs naturally) with its own immune system. Mercury, and its nuero-degenerative effects, were also covered, and linked to autism. The HPV vaccine is being recommend for men, even though they don’t have a cervix. 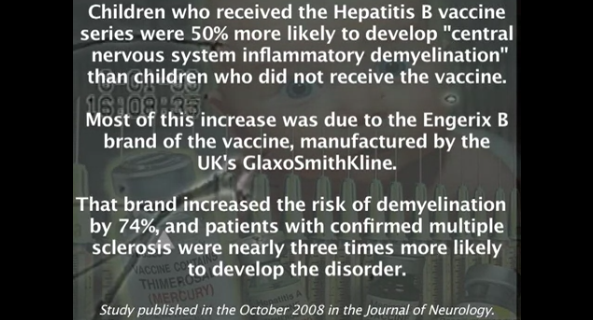 Hepatitis B vaccines in infants make about as much sense as giving them condoms. Your consent is required prior to have the government test biological weapons on you. However, in a representative form of government, your elected official can give consent on your behalf. Leftover mass from aborted fetuses are saved for further vaccine development, ala cell based vaccine/human diploid cell strains. So they take aborted fetuses and sell them to the pharmaceutical companies. Interesting. Seems like abortion was made legal in America for the purpose of acquiring cheap fetal tissue.